From the Observatory’s web page…. Ohio University opened a new campus observatory for undergraduate teaching and public outreach in May 2017. Public telescope nights are hosted on a regular basis. Public Telescope Night is hosted by the Ohio University astronomy faculty and students; it can be canceled if the sky is cloudy or stormy. To find out about cancellations please check the Twitter feed of OHIOobservatory. OU’s new observatory had its formal opening in May 2017. “This is the first time in the history of Ohio University that we have a permanent domed structure on campus to shield the telescope and audiences from the elements,” explained Dr. Doug Clowe, Professor of Physics & Astronomy and Director of OHIO’s Astrophysical Institute. 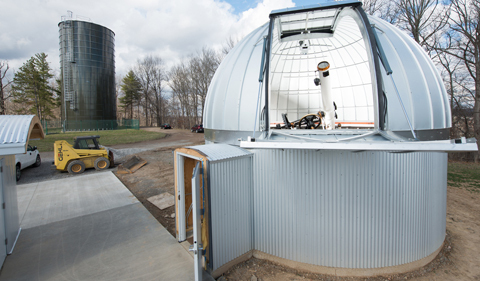 The facility hosts the university’s refurbished 10-inch Fecker telescope in a 22-foot-diameter Ash dome, as well as a utility building and outdoor observation pad for portable telescopes. 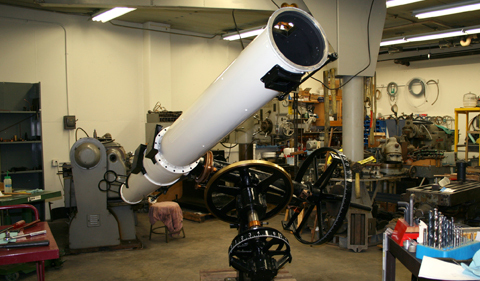 The Fecker refractor, dating from 1950, is of classic design and has been fully restored to its original condition by Physics & Astronomy technical personnel, providing excellent opportunities for visual observing of planets and other celestial sources. The observatory is designed for future expansion to include a second dome housing a larger-aperture reflecting telescope suitable for advanced quantitative laboratory classes using modern instrumentation and digital detectors. The observatory is located at the periphery of the Athens campus, near The Ridges water tower, providing ready access for students and community members while maintaining distance from major sources of light pollution. Users of the facility will benefit from night-sky preservation efforts over the past dozen years by Ohio University astronomers, including successfully championing the adoption of shielded fixtures for campus outdoor lighting and authoring an ordinance for control of light pollution that was adopted by the city of Athens. The observatory is located in close proximity to buildings with seminar and auditorium space, providing flexible options for classroom activity and larger events scheduled in conjunction with night-sky viewing sessions. The observatory is well-designed to support visits by groups, including K-12 class outings. Ohio University’s Physics & Astronomy Department maintains a very active program of public outreach in astronomy, with public viewing via portable telescopes, but has lacked a dedicated venue since the closure of an aging rooftop observatory over a decade ago.